How could change the length of the dkim key. Since many servers are rejecting me emails because the header exceeds the size of 998 bytes, and the field length exceeds the dkim signature. IF a server rejects your mail even with a key-strength 1024, you should send a mail to the postmaster. in place that tells me I do not see anything about the length of the dkim signature. I installed this patch for some customers in the last few days and i was always able to change the key-strength. my TXT record for DKIM is shortened in Bind zone file.. Key pair (2048bit) is generated correctly, even in MySQL table is full length. On one of screenshots in your blog (http://blog.schaal-24.de/wp-content/uploads/2013/05/DNS-create-Template.jpg). I saw record in Zone Templates. Tell it it is necessary to bring manually or not? Correct me if i´m wrong: you found this on a page for the patch < 1.0? With 1.0 you don´t need such an entry in your template. If you create a key in the mail-domain, the dns-record will be created, too. 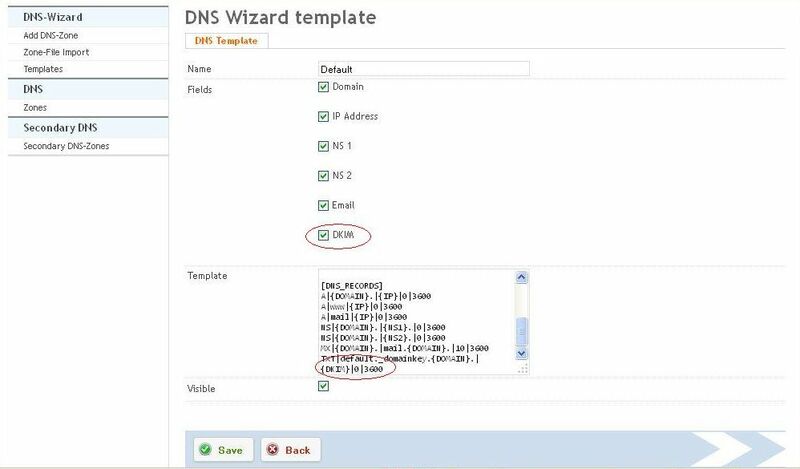 If you would like to setup the dns-wizard to create a dkim-record, just enable the checkbox. Is there a way to disable the wizard for SPF ? Cause I can’t write my own dns entry. And the spf wizard doesn’t allow me to make an include. Everything in “Any domains that may deliver or relay mail for this domain” should be used as an include. Are you sure that amavis verifies the key against your own dns? It takes some time to update dns-records worldwide. Try dig @127.0.0.1 default1420755328._domainkey.YOURDOMAIN TXT to querie your local dns. I’ve just installed you last patch after I installed opendkim. But now I wonder how and if to configure opendkim to work with ispconfig an your patch. The DKIM-integration uses amavis instead of opendkim to sign emails. 1) about compatibility with upcoming ISPConfig 3.1 where DKIM will be integrated. Is this patch the same code as will be used in this version? Is it safe install this patch and than upgrade to ISPConfig 3.1 when it will be ready? 2) is this patch work correctly in multiserver setup? We have separated mail server on its own server. On which server should I install this patch? On master ISPConfig server and mail server? 1. The Code between this patch and ISPConfig 3.1 is quite the same. You can apply this patch and afterwards upgrade to 3.1. 2. I use this in a multi-server setup so i´m sure it works without any problems. Run the installer on every server that runs mail and/or dns and also on the interface. This doesn´t matter. The files are created with 644, but the DIRECTORY should owned by user and group amavis with permissions 750 or 770.